When you're on a tight budget, investing often feels like something only wealthy people can afford to do. If you have just a few dollars left over every month, you might think it's out of reach for someone in your shoes. This is particularly true among young people. A 2016 Stash survey reported that 41 percent of millennials feel that they don't have enough money to invest in the stock market — and 70 percent feel they need at least $100 to get started. That mentality can be a costly mistake. If you don't invest, you greatly risk underfunding your retirement savings. Many traditional brokers have high minimum investments. For example, Vanguard has a $1,000 minimum if you want to open a Roth IRA and $3,000 for some other accounts. When you have just a few dollars to invest, opening an account with a traditional broker can be impractical, if not impossible. If your budget is tight and finding even $50 a month to invest is impossible for you, spare change investment apps like Acorns might be a smart option. With Acorns, you connect your credit and debit cards to your account. Any purchase you make — including routine things like groceries or gas — is rounded up to the next dollar amount and the extra change is invested. For example, if you bought lunch and it cost $6.50, the app would round it up to $7, depositing the extra 50 cents into your investment fund. As your income grows and your financial situation improves, investing spare change and micro-investing might not be as effective as it should be. Your investments with those apps might only add up to $15 to $20 per month. 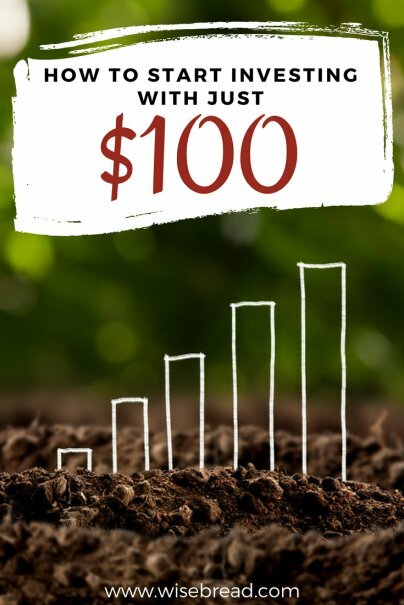 That's a good start, but you'll get better results by investing larger amounts. That recurring $100 per month transfer can pay off in the long run. If you are 25 and make a one-time $100 investment, that $100 would turn into $2,172 by the time you're 65 (assuming an annual return of 8 percent). If your employer offers a 401(k) plan, you can start investing right away; there's no minimum to open an account. You can set up regular deductions from your paycheck, so the money is invested automatically every single month. You likely won't even notice it. You can start investing small amounts, if that's all you can afford at first. For example, you can set your 401(k) contributions to as little as $25 each pay period. Over time, compound interest can turn those small investments into big returns. You really can't afford to avoid the stock market if you plan on having a stable retirement. Without the muscle of annual returns, you run the very real risk of coming up short.